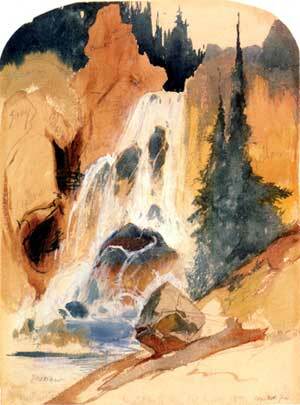 guest artist with the Hayden Survey expedition into the Yellowstone region in 1871. An architectural proposal is generally best comprehended through a preliminary sketch, which, hopefully, will bare the soul of the construction, passing easily over a welter of blueprint details to that one thing that is important to the man who is about to commission a workits suitability to his purpose. Admittedly, the craft of writing does not have an exact counterpart to the architect's beautifully embowered presentation of his dream; and yet, the author or editor can accomplish a somewhat similar purpose by giving his readers a preliminary glimpse of the organization and scope of his subject, or, put in plainer terms, something of the dreaming behind the scheming. In this case, the subject at handa history, based on documents, of the exploration and establishment of Yellowstone National Parkappeared to lend itself to division into three major parts, presenting, in turn, the accretion of early knowledge, the accumulation of a definitive knowledge, and the progression of the park movement. Those principal divisions have been subdivided in a manner to show the contributing influences: that is, Part I has subsections setting apart the fragmentary knowledge gained by Lewis and Clark, the fur trappers, the military and religious explorers, and the Montana prospectorsa comprehensive, yet largely ineffectual cognizance; Part II covers the definitive knowledge resulting from three determined explorationsthose of the Folsom party (1869), the Washburn party (1870), and the Hayden and Barlow parties (1871), while Part III covers the publicity and legislative aspects of the park movement to its successful conclusion in the establishment of Yellowstone National Park. Ideally, such a compilation should include the complete text of all important source documents; however, the bulk of the available materials, particularly within Part II, precludes such thoroughness. Faced with the necessity of either presenting selected source documents in their entirety or of relying mainly upon excerpting from a much wider range of materials, the latter was adopted in the belief that it would prove more useful to readers. This will introduce them to both the standard sources and a variety of lesser items which, taken together, are very important to any serious consideration of the establishment of our first national park. Of course, such a procedure required a connective text to give relevance to the excerpts. However, the added text is not intended as compiled history, for it is seldom complete enough to serve more than its admitted purposean aid to a review of what is available. Footnotes have been added both to document and to clarify the materials used. The author wishes here to acknowledge, in general terms, the all-important assistance of many personsfriends, colleagues, typists, research assistants, archivists, and librariansthough he is aware that this places him somewhat in the position of the man who was asked why he did not say grace at table. His reply was, "He knows I am grateful." I only hope they know it! Something does have to be said in more specific terms concerning libraries and repositories used. The source documents and related materials consulted, except for a few rare items, were found in the following places: The Yellowstone Park Reference Library, Yellowstone Park, Wyo., holds the original of the Daniel T. Potts letter (which provided the earliest published description of Yellowstone features), and the original notes of Nathaniel P. Langford's eastern lectures, in its park-oriented collection of publications, manuscripts, photographs and archivesa unique special collection; the Montana Historical Society, Helena, holds the Cornelius Hedges diaries and papers, the Warren C. Gillette diary and the Samuel T. Hauser papers, which, with its excellent files of early Montana newspapers, formed an invaluable resource; the Montana State University Library, Bozeman, holds the manuscript copy of Lt. Gustavus C. Doane's report, and also has a Leggatt collection containing many rare published items; the Minnesota Historical Society, St. Paul, holds the Nathaniel P. Langford papers (diaries, letters, and scrapbooks), and is custodian of the old files of the Northern Pacific Railroad; the Beinecke Rare Book and Manuscript Library, at Yale University, New Haven, Conn., holds William Clark's manuscript map (on which he recorded the visit of John Colter to the Yellowstone region), the manuscript for Osborne Russell's Journal of a Trapper, the diary of Samuel T. Hauser and a copy of the journal of A. Bart Henderson; the Pennsylvania Historical Society, Philadelphia, holds the Jay Cooke papers, which throw much light on Nathaniel P. Langford's connection with the Northern Pacific Railroad and its promotional schemes; the Library of Congress, Washington, D.C., holds Gen. James Wilkinson's letters relative to the Yellowstone regionthe earliest intimation of its unusual characterin the Jefferson papers, while the vast collection of newspapers found there was particularly helpful in checking eastern coverage of park events; the National Archives, Washington, D.C., holds important maps, and also the several collections of papers relating to the Geological Survey of the territories (Hayden Survey), the office of the Surveyor General of Montana Territory, and to the Yellowstone legislation; the Pius XII Memorial Library, St. Louis University, Mo., holds Father Pierre-Jean DeSmet's manuscript maps covering the Yellowstone region; the Gilcrease Museum, Tulsa, Oklahoma, holds the papers of Thomas Moran; the Henry E. Huntington Library, Pasadena, Calif., holds the papers of Philetus W. Norris, including nearly all that remains of his letters which appeared serially in the Norris Suburban under the heading "The Great West"; and the Bancroft Library, University of California, Berkeley, holds the only considerable file of that unusual news paper, The Frontier Index, as well as an incomparable collection of other western newspapers. Other collections used less extensively were those of the Denver Public Library, Colorado; the Church of Jesus Christ of Latter-Day Saints, Salt Lake City, Utah, the Philadelphia Free Library, Pennsylvania; the St. Louis Mercantile Library, Missouri; the Bozeman Public Library, Montana; and the Missouri Historical Society at St. Louis. The research phase of this project also led the author into friendship with some delightful people, among them, Truman C. Everts, Jr., son of the explorer lost in the Yellowstone wilderness, Miss Beatrice deLacy, niece of that stalwart engineer-explorer who led his "40 thieves" across the southwestern corner of what is now Yellowstone Park away back in 1863, and Mrs. Oscar O. Mueller, nee Josephine Cook, daughter of explorer Charles W. Cook. It was her fondest wish to be present at the Yellowstone centennial observance, as her father was presentthe last survivor of all the early explorersat the celebration of the semicentennial in 1922. Fortunately, it was so.